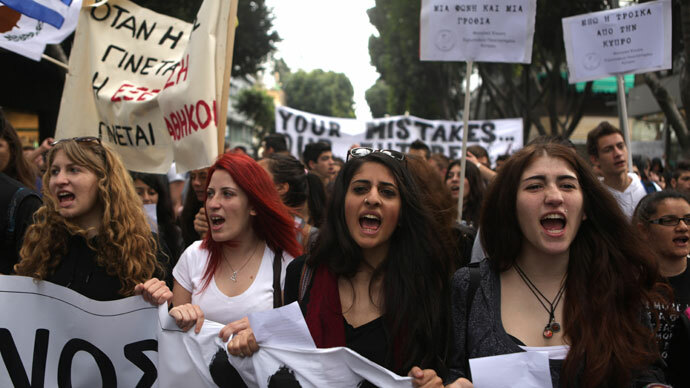 Scores of Cypriot students have flocked to the presidential palace, chanting slogans and waving banners, following the announcement that banks will not reopen until Thursday. 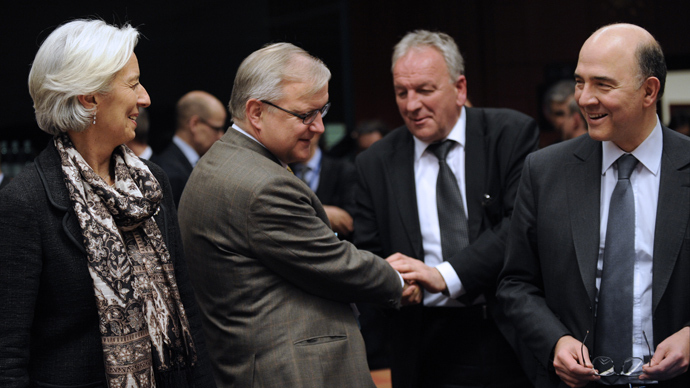 The eurozone bailout has heightened frustration at the government. The eurozone bailout did not alleviate the island nation's worries. Residents who have not taken to the streets in anger are also feeling the pinch, especially with the central bank remaining closed. 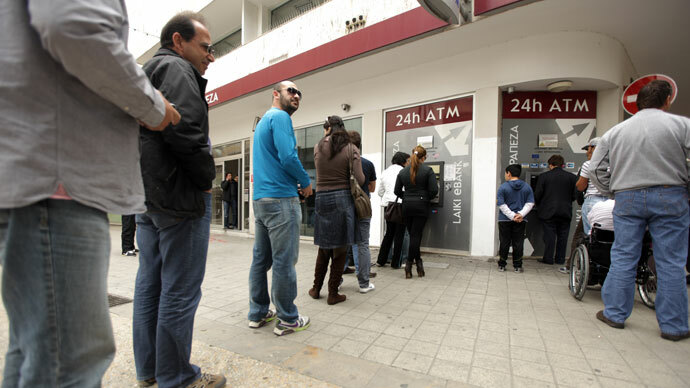 Cypriots feel that a line has been crossed, and are worried about cash flow, jobs and savings. 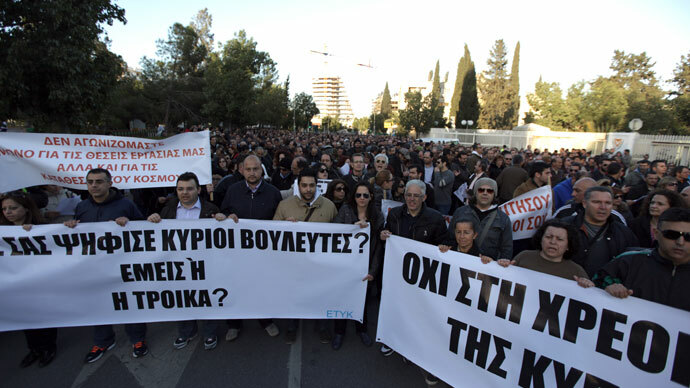 “It is like they want to push us – the Bank of Cyprus – after a few months, to collapse? I wonder – what is this? It’s not fair,” he added. The bailout plan has been met with widespread anger, with few residents welcoming the deal. “They’re very frustrated,” said RT correspondent Tesa Arcilla, who is in Cyprus. “This has really sent a very bad message to people. 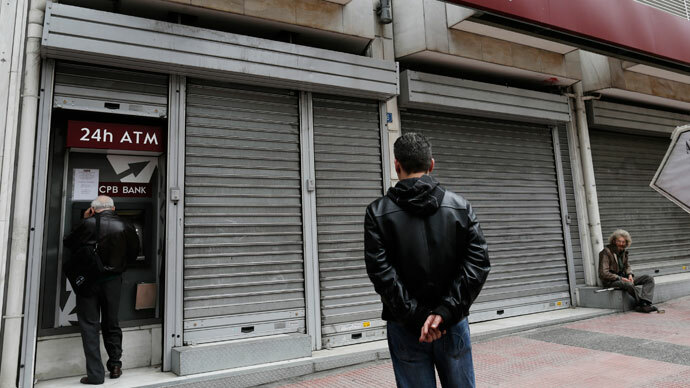 They’ve lost confidence, they’ve lost trust.” All Cypriot banks will remain closed until Thursday, despite an announcement late on Monday that they would reopen on Tuesday morning. 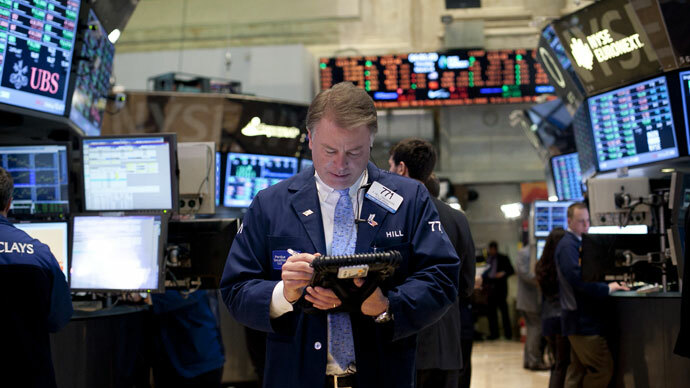 The move has prompted concern that the country’s financial institutions are even lower on cash than expected. “We won’t [be] Germany’s slaves,” one read. 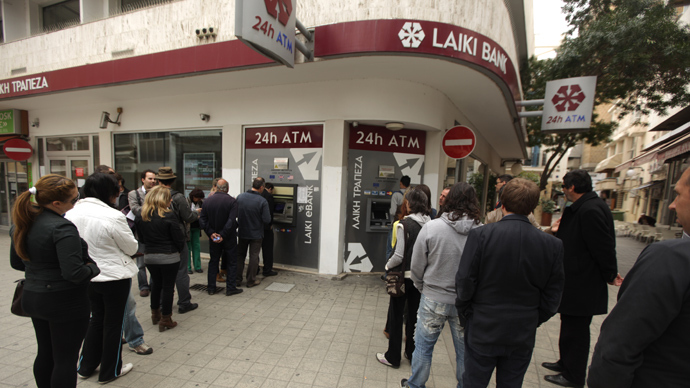 Capital controls are still in place in Cyprus, meaning that banks are able to impose restrictions on the amount of money citizens are able to take from the ATMs, or how much money they can move around. 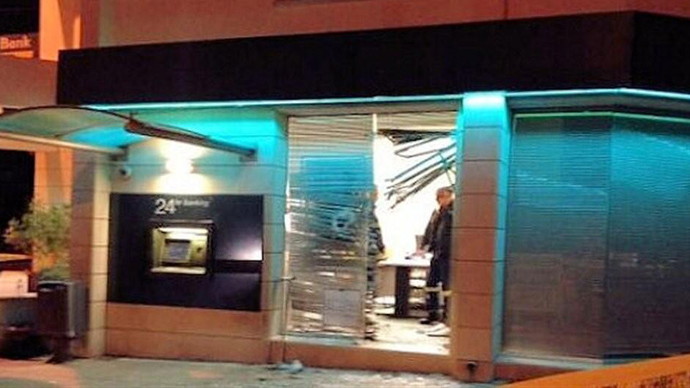 “We have no cash. We are just… queueing behind the ATM machines, waiting to get some cash. For how long?” one resident said. The restrictions are creating an intense atmosphere of uncertainty, and some mild hoarding of cash supplies. “Everybody is trying to hold onto those 5 or 10 euros that they have just in case there’re even lower limits, because right now they can only take about 100 euros,” Arcilla reported. Some are even feeling nostalgic for the old Cypriot pound. “With the pounds – peace and quiet,” another resident said. The recent events in Cyprus have prompted fears that similar moves could be enforced in other countries, and could be a template for how problems are dealt with in the future. “If there is a risk in a bank, our first question should be 'Okay, what are you in the bank going to do about that? What can you do to recapitalize yourself?' If the bank can't do it, then we'll talk to the shareholders and the bondholders, we'll ask them to contribute in recapitalizing the bank, and if necessary the uninsured deposit holders,” Dutch Finance Minister Jeroen Dijsselbloem told Reuters. There is additional concern that Germany may have been trying to make an example of the country, and that a precedent has been set for potential future bailouts. “If there’s unrest in Cyprus – it’s not Portugal. It’s not Spain, it’s not Greece – it’s not a massive country. So what Germany was actually able to do was to enforce its might on a small country in which any kind of unrest, violence or protest will be relatively contained,” said Financial Advisor Margaret Bogenrief, co-founder of ACM Partners. “If you’ve been reading the press – they’ve been extremely upset about footing the bills for these other countries, and I think what they were saying was ‘look, just to let you guys know – we can do this,’” she concluded.